Finnair, Finland’s national flag carrier, marked 90 years of operations this year. On 24 March 1924 a Junkers 13 carried 162 kilos of mail from Helsinki to Tallinn in Estonia. In its first year of operations it carried a total of 269 passengers. The growth of the airline can be said to run parallel with the history of Finland itself. Isolated from the rest of Europe by an unpredictable Baltic sea, access to ports were often hampered. It needed aviation. 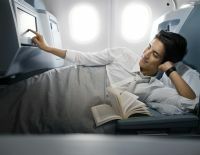 Finnair now serves over 60 destinations in Europe and connects over a dozen long haul hubs in Asia and north America. The fleet consists of Embraer and Airbus types transporting nine million passengers annually. Whilst Finland may seem to be remote compared with the rest of Europe, the airline has recognised the potential of its northern positioning and taken a strategic focus on route development and has a niche as a rapidly growing Asian hub. Helsinki Airport is compact with European Finnair flights connection times averaging a nicely manageable 40 minutes. June 2013 saw the addition of Xian (China), and Hanoi (Vietnam) to a growing Asian network that now features 13 cities connecting 60 European destinations. Currently the only European airline flying directly to these destinations, I was in Business Class on the inaugural service to Hanoi, a revelation in terms of passenger experience and comfort. Heathrow and Manchester connect well. The A330-300 that headed out to Hanoi on 15 June at 16:30 was near to maximum payload with 276 passengers, and cargo weighing 232,000 kilos, including seven tonnes of North Atlantic Salmon. 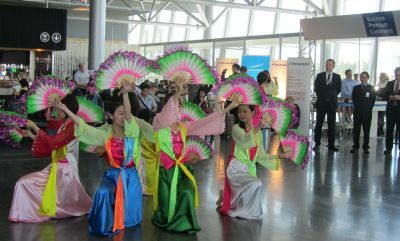 Vietnamese dancing girls and traditional music welcomed passengers in celebration. For 2013 the seasonal Hanoi route, ending 27 October, departs Helsinki three times a week on Saturday, Tuesday and Thursday, returning the following day. However Allister Paterson, Senior Vice President, Commercial Division, says: "We are in the business of connecting Europe and Asia and we are aiming to eventually offer the connection year round". Finnair’s in-flight experience is honed for maximum passenger relaxation. Cabin design is led by the airline’s ultimate goal of bringing peace of mind to the modern travel experience. It works too. The fresh and harmonious livery reflects the colours and shapes of the earth, lakes and skies of the land of the midnight sun. 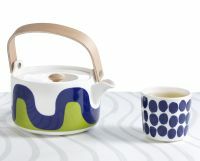 The styling is retro informed and is inspired across the board by Finnish design and fashion house Marimekko which teamed up with Finnair in Spring 2013 to enhance the decor. 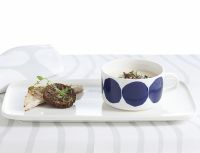 The designs created for Finnair include a collection of textiles and tableware featuring Marimekko’s classic patterns especially fashioned by Sami Ruotsalainen to add a light and fresh visual dimension. Calm blue, green and light grey tones instill a tranquil atmosphere even on a full flight. The design is also practical as Business Class tableware is made of light porcelain especially suitable for use on aircraft. It’s the first time I’ve ever contemplated “borrowing” one of an airline's cup and saucer – they are that desirable. The Business cabin is split across two areas, 30 in the front section and 12 behind with seats configured in a 2+2+2 layout. They are traditional Business cabin style, forward facing with winged head rests. The seats are powered by a motor drive to offer a plethora of seat positions; foot rest up at your preferred angle, head cushion raised to your specific height, back at a certain angle, arms at a precise level. 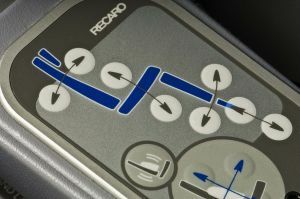 All positions can be finely tuned to each passenger's preferred position. Once the perfect posture is found a seat memory function can memorise your preference. Should you choose to sit up to eat, you can then press the M button which returns it to your selected format. In addition, suggested eating, relaxing, reading, and screen watching positions are pre-programmed. Whilst not complete lie flat beds the opportunity to manipulate the layout ensures each passenger can find an optimal sleeping position too. The tables fold out from the central arm rests and expand into a good sized table which will hold even the largest laptop. Seats are separated from fellow passengers by dividers so individual privacy is maintained and a deep recess behind the seat in front provides space for bags, travel apparel and even your feet when you are at full stretch. The 14” TV screen rests in the seat divider and enables passengers to alter the angle to ensure the best screen visibility. Headphones are provided and the in-flight entertainment can be managed by a manual remote control, or via the touch screen facility. The selection offers contemporary, classic and international movies, alongside episodes from TV dramas, music and games for child and adult alike. Should passengers prefer to read, an overhead reading light offers three levels of lighting. The beam of light is designed to prevent light particles spilling over on to the sleeping neighbouring passenger so again provides privacy and comfort. The amenity bags will please the green hearted traveller. A brown recyclable pouch contains socks, ear plugs and an eye mask, keeping it simple. However the bathrooms offer a basket containing other items such as lip salve, shaving cream, razors, moisturiser, toothpaste, toothbrush and deodorant. Green tea based products tingle on your skin. It’s a great idea as passengers are able to take just what they need, after all most females' need for shaving cream is limited. It's not just the cabin design that is fresh, the menu and in-flight dining offers inspired international three-course menus featuring delicious options. Welcome drinks of Joseph Perrier champagne, carefully selected wines, spirits or juices are accompanied with a mix of nuts and dried fruits. A dainty amuse bouche, reindeer mousse on our flight, is followed by a choice of two starters – a duck salad or mouth watering creamy green pea soup; mains included fresh hake, beef Vietnam style or vegetarian option of mushroom risotto. Meals are completed with deserts and/or cheeses accompanied by port or desert wine. The meals were served in a timely and relaxing manner and the flight attendants, some of the most charming in the sky, were sure to never leave your glass unfilled. For those needing to work, sleep or who simply want something light, a quick option is available which offers appetisers, soup and a selection of cheeses. Snacks are also available throughout the flight from the galley on request. Two hours before arrival a hot egg breakfast was served.